I ask myself the same thing every day. 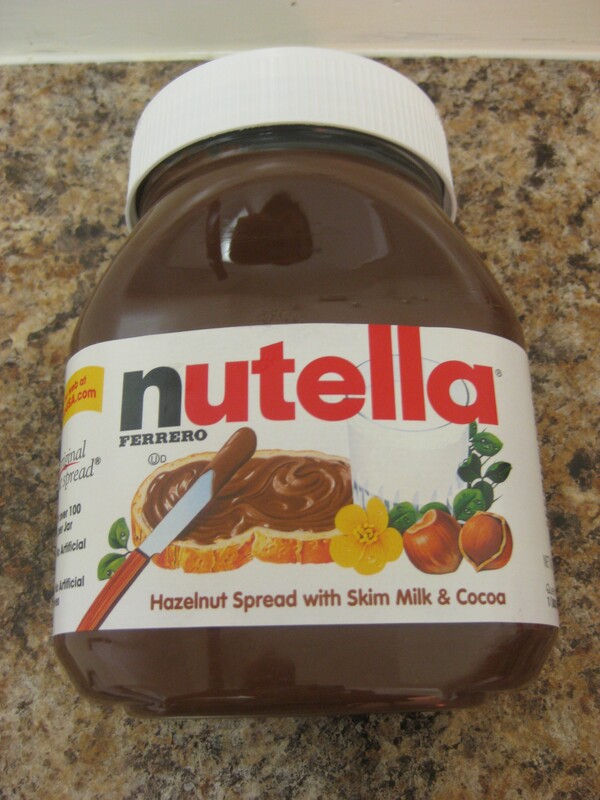 What was the world like before Pietro Ferrero and his son Michele invented Nutella? How did people live? The simple answer is, they didn’t! Lately Nutella is everywhere. In fact, it’s so big – and so widely loved – that February 5th became World Nutella Day. Pimping their image, Nutella came out with a new advertising campaign claiming to be a healthy breakfast. This is where you lose me. I am a self-proclaimed sweet-o-holic, but even I know that Nutella is no match for a healthy breakfast. In fact, the commercials claiming that it’s made with fresh hazelnuts, skim milk and “a hint” of cocoa is a bunch of malarkey if you ask me. Let’s all do ourselves a flavor and admit that yes, Nutella is insanely good, and yes, Nutella is the perfect topping for any crepe or brownie, and yes, the Ferrero family is brilliant, but please, oh please, let’s not convince ourselves that Nutella is part of a wholesome, balanced diet. It’s not. And it never will be. So, for the time being, let’s focus on the perfectly creamy treat, and how it found its way into my Gelato. I made this flavor as a special gift for a friend who, not so subtly, mentioned that Nutella is one of her favorite things in the world. This girl has managed to put Nutella in everything from brownies to waffles. But, she doesn’t ever need an excuse to eat Nutella; she tells me that it’s just as good straight out of the container. As if I didn’t know that already. I don’t necessarily discriminate against Nutella. In fact, give me a jar, and I’m likely to take a scoop right off the top. But during my informative tour of Amorino Gelato I learned that Nutella produced here in the US (typically sold in plastic bottles) and that produced in Europe (available in glass jars) actually taste quite different. Naturally, I made this flavor with the US-produced version (still totally delicious, don’t worry) but next time I’m going to use the European version for an even more authentic taste. But for the time being, grab a spoon and dig in. The was absolutely outrageous and one of my personal favorites. Adding Nutella into the milk mixture. Getting very excited. Whisking the egg yolks and sugar. Let the tempering begin. 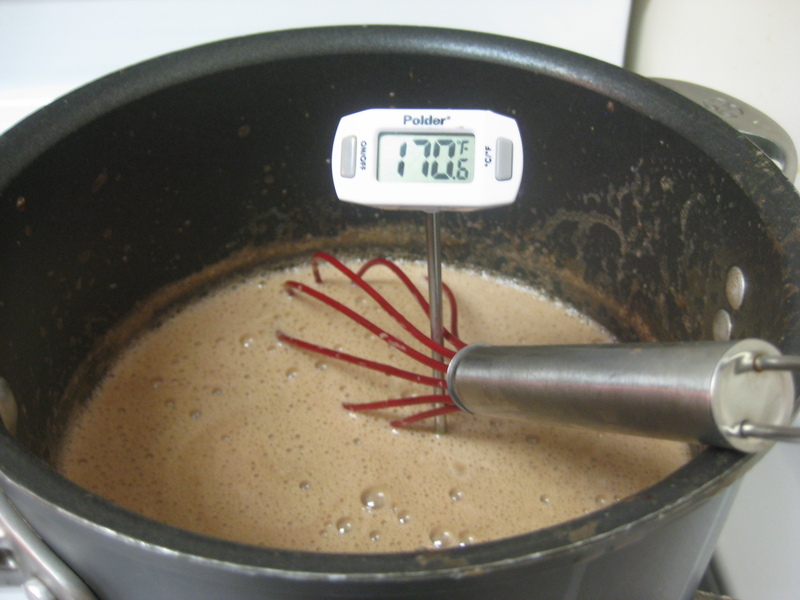 Heat the milk and cream in a heavy duty saucepan. 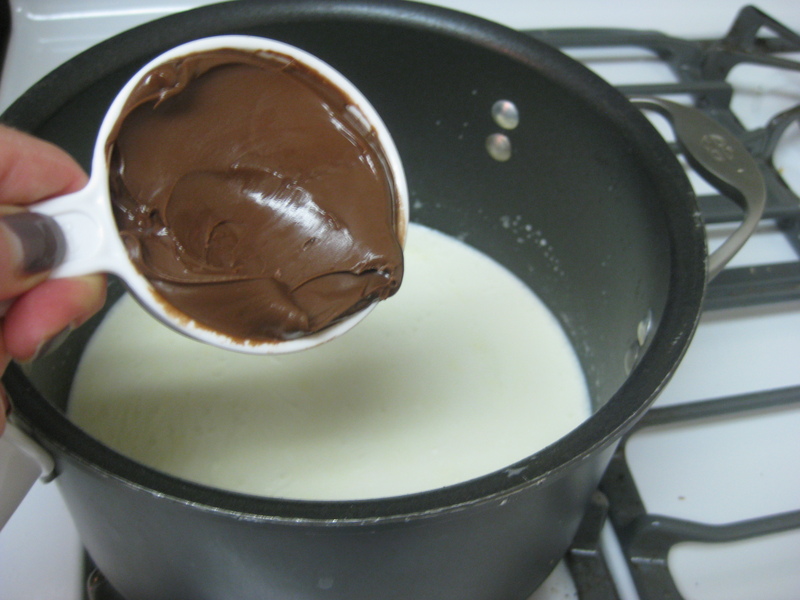 Once bubbles start to form around the edges, whisk in the Nutella so that it fully incorporated into the liquid. Turn off the heat and set aside. While the milk and cream mixture is heating, whisk together the 4 egg yolks with the 1/2 cup sugar in a large, heat-proof mixing bowl. Add sugar slowly until the egg yolks get thick and pale yellow. 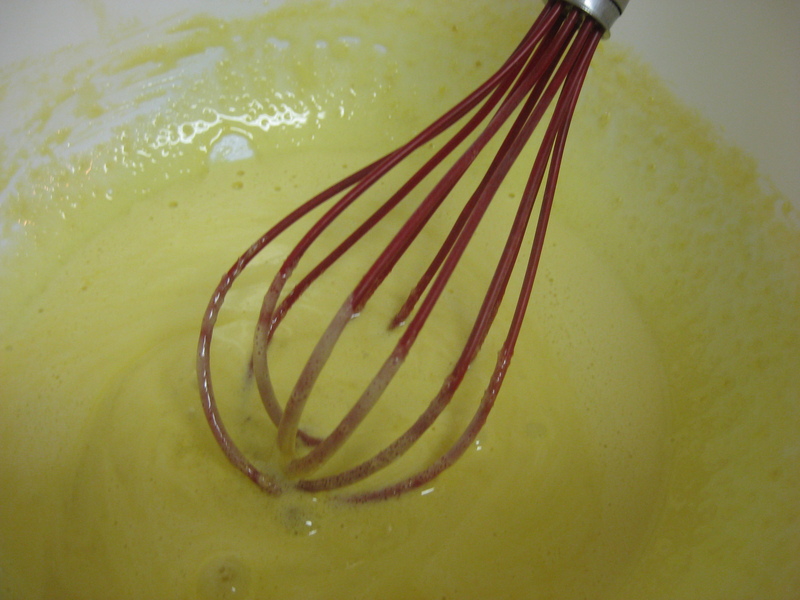 Once the sugar and egg yolks are fully blended, slowly pour in the hot milk mixture to temper the eggs. Once the milk and egg mixture is fully combined, pour it back into the saucepan and heat until the mixture reaches 170 degrees F (which is when the egg yolks are fully cooked). Add the vanilla and let the mixture cool completely before refrigerating for at least 2 hours or overnight. Once fully chilled, pour into the bowl of an ice cream maker and churn for approximately 20 minutes or according to the manufacturer’s instructions. Scoop into a freezer safe container (if you even make it that far) and freeze. 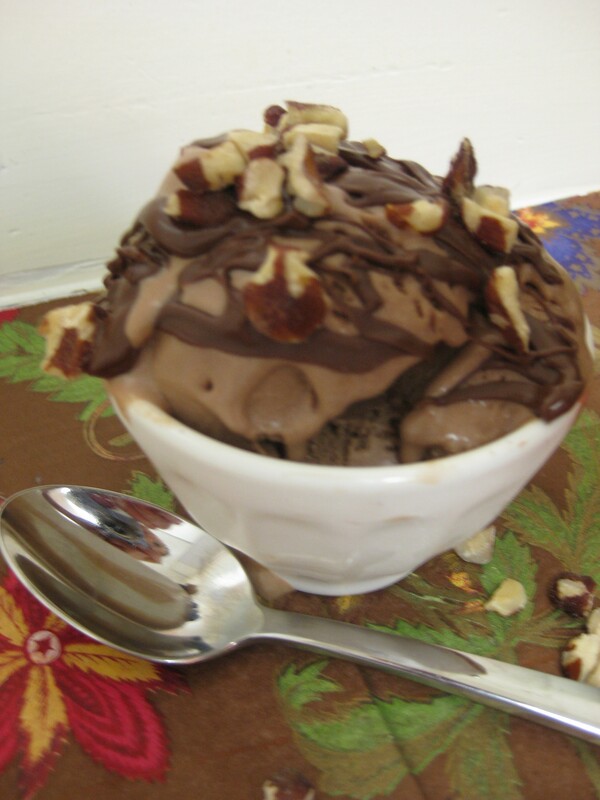 When you’re ready to eat it, place two generous scoops of Nutella Gelato into an ice cream bowl, drizzle Nutella on top, add a few toasted hazelnuts and enjoy! Up close and personal. Pure heaven. The Verdict: This. Is. So. Good. (And very addictive . I’ve had two bowls in the time it took me to write this post). To be honest, though, when I first tasted this gelato it was too sweet for my liking (I know that sounds insane coming from a lover of all things sweet). 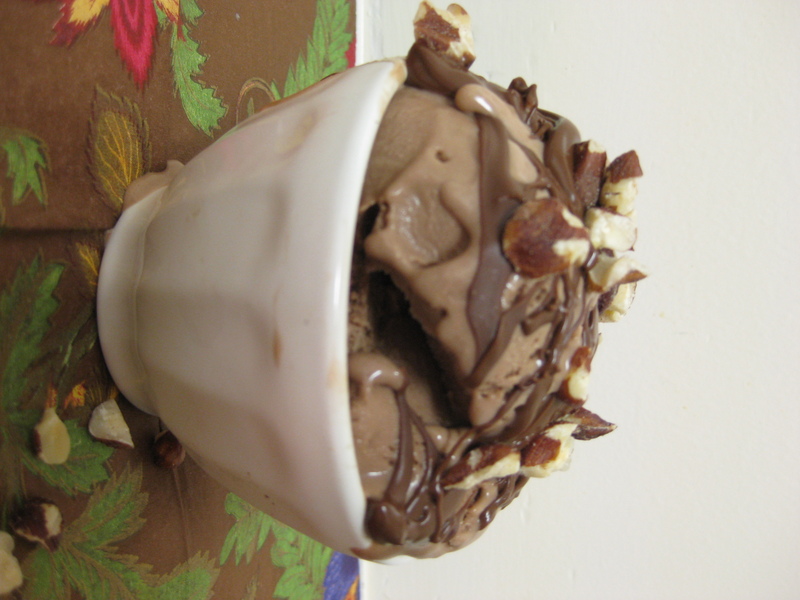 But, once the gelato sat overnight in the freezer, it miraculously lost some of its sweetness, and the Nutella flavor became more prominent. There’s probably a culinary term for this phenomenon, but since I don’t know what it is, I recommend that you let this flavor sit overnight before eating it. The good news is that it’s still delicious (if not more delicious) a week later. I really just can’t get enough. Hopefully my dear friend, the self-proclaimed “Assistant Director of Flavor Creation & Tasting” liked this flavor as much as I did. De-li-cious! This is absolutely magical (but i can see why you would want to make it with Euro-Nutella.